Every Tuesday and Thursday, the dogs in advanced training hop into the SSD van, and we head out to visit public places like Giant, Target, the Harrisburg Mall, the Colonial Park Mall, or like today, Messiah College for the Special Olympics. Working in public is an important part of a service dog’s training, because once they become a working service dog, that’s exactly what they’re going to be doing. Working in public. And that means they need to be comfortable working in any environment and situation, wherever life with their new partner takes them. We have 16 dogs in advanced training right now, and in order to take them out in public, we rely on a group of volunteers to work with the dogs on these public outings. Our public volunteers are amazing! Each Tuesday and Thursday, they meet us at the designated location, and we hand them a dog to work with for two hours. Carol Fricke enjoys working with different dogs each time she volunteers. “Each dog has their own personality, and it’s neat to see,” she said. Carol started volunteering with our advanced training dogs in public four years ago. When she retired from teaching, she decided that since she loves animals, she’d look for volunteer opportunities with dogs. A news article about SSD convinced her that this was the opportunity she was looking for. Plus, “I can work with the dogs and not want to take them home with me, because they’re going to be doing such a great service,” she said. Some of our public volunteers also volunteer in other areas of SSD. Mel has helped with team training and occasionally with Meet the Dogs, where people on our waiting list get to meet and hopefully make a match with one of our dogs in advanced training. Darlene Furlong has worn just about every hat there is at SSD. She’s been volunteering with SSD for 11 years, and in addition to training the dogs in public, she helps with puppy raiser interviews and preliminary interviews for people applying for a service dog. She has done service dog demonstrations and is a puppy sitter. Like Mel, she has helped with Meet the Dogs. 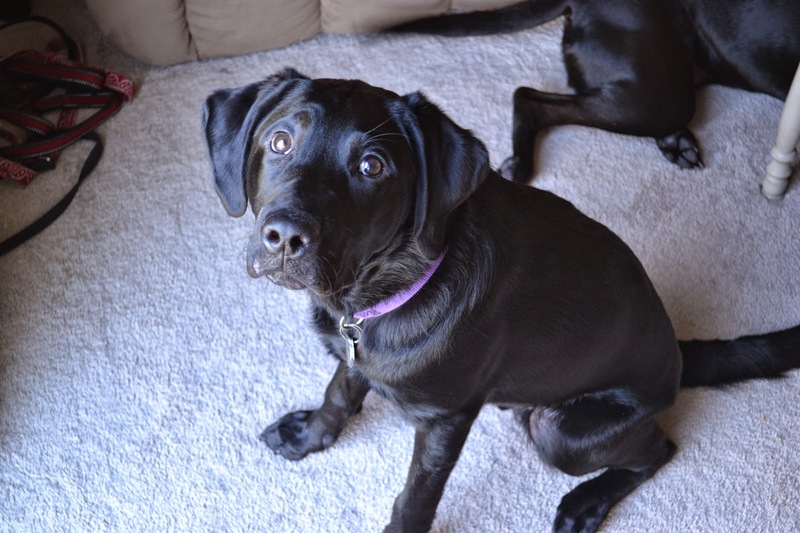 She served as a puppy coordinator for a little while and has given private lessons to puppy raisers and demo teams. She and her husband have transported dogs to and from other service dog programs in many different states, and in her travels, she helps recertify our working service dog teams all along the East Coast. Thank you to all of our public volunteers for working with our dogs in advanced training and helping them perfect their skills! Guest post by Meghan Miller. She and her husband have raised SSD London and are currently raising SSD Garnet and SSD Slider. It's the number one question I am asked as a puppy raiser for SSD. How long do you raise them? How much do they pay you? How can I get involved? And both my most frequently asked and the most heart wrenching: How can you give them up? Before our first dog was placed, all I could say was, "I don't know but it will be worth it." Now that we have said our goodbyes and our boy has started the life he was meant for, my first thought is “Don’t cry.” And I usually say, “It’s not easy, but it’s worth it.” The truth of the matter is that it is extremely hard to give up your dog. You try to tell yourself they never belonged to you, but after 18 months of training and cuddles and puppy kisses, they certainly feel like your dog. The question I am always waiting for, but rarely asked, is why? Some raisers do this as a way to teach their child about volunteerism, or because they want to make a change in someone's life, or because they love dogs, or because they love the mission of SSD. Our reasons were originally far more selfish: I found myself on an impossible phone call one day while living in Portland, Oregon. Three thousand miles away, my best friend had received potentially terrifying news from her doctors. "They are talking about the big C," she whispered—cancer. We couldn't even say the word. It was one of those moments where the world came to a screeching yet silent halt, the kind you find yourself gripping the counter so you don't go flying off. A moment you know will affect you in a profound way, but one you have no control over. I'm the type of person who likes to have control over the every possible detail, so I found myself bargaining with God, Buddha, the universe, anyone and everyone who would listen. I was doing dozens of good deeds each day, from holding doors for the person who's about 30 feet out of appropriate door holding range, to moving slugs into shadier spots on the side walk, to giving out money and granola bars to homeless people. I seized every opportunity, reaping almost instant reward - no one had better luck than me. But what I was hoping for was some karma to be sent back east to my best friend. When my husband and I moved back to PA, we started raising for SSD, hoping that fundamentally changing the life of a person in need would provide the necessary cosmic debt to reverse my friend’s ill-boding omens. I was handed a chubby ball of fluff, a licking machine named SSD London. I could outline how much and why I love SSD London in great detail, but this story isn't about falling in love – it’s about finding incredible satisfaction among equally incredible heartbreak. When I dropped him off at the kennel on the final night before Team Training, I cried the whole way there and sobbed the whole way back. I had prepared myself for the pain that would come with being raiser, even cautioning myself that it would be worse than I imagined. And it was. So. Much. Worse. But a funny thing happened over the next two weeks as I watched my dog fall in love with his new partner. Just hearing the stories about them absolutely wasn't enough. I still thought, "It's impossible for someone to love him more than I do." But the moment I saw her, the newest love of London's life, sleeping on “my” dog, was the moment I truly understood he was never my dog. We were lucky enough to share a meal with London’s forever family and hear all their hopes and concerns about bringing a new dog into their life, one for which they had been waiting for over four years. At the end of the night I kissed my boy goodbye and wished them well, and once again sobbed the whole way home. Since then we've kept in touch. I have been able to watch London give his partner a whole new life - new freedoms, new responsibilities, and new dreams. I have watched other teams stop seizures, help with walking, and open doors both literally and figuratively. Every interaction between dog and partner has been worth the tears I shed when I said goodbye. When I am at my wit’s end or feeling discouraged, I cling to the knowledge that I have made a real and lasting positive impact on someone's life. The night we learned that London would be starting Advanced Training was also the night I received a text message with a picture of my friend's clean bill of health. By that time we had started a new journey with a second dog. My friend was sure to thank us for raising them, citing our dogs as the reason for her good karma. And so we give up "our" dogs. We raise them for the friend I couldn't help and for the family we could. For the mission statement. For the community of raisers, sitters and huggers. For the opportunity to teach about giving. For a shorter waiting period for the next partner. For another dog in the house. For the opportunity to change a life. So in the end, the answer to that constant “How” question is just another question. 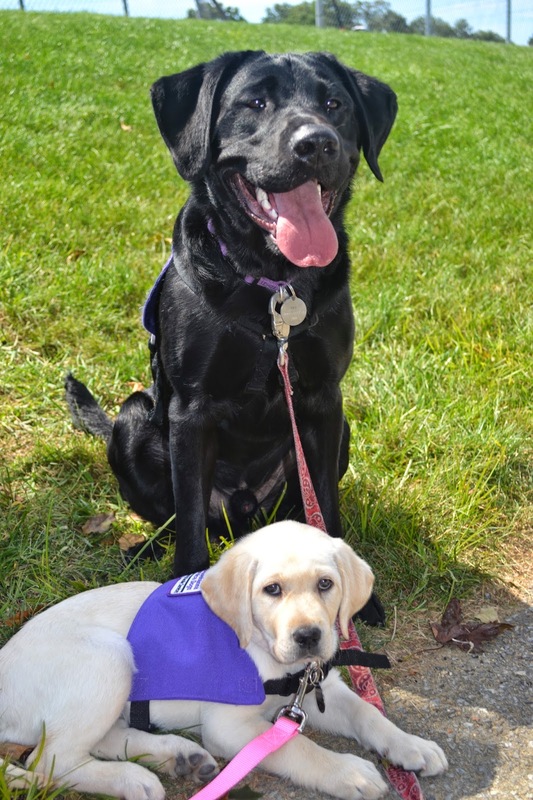 Join Meghan and Susquehanna Service Dogs for the Highmark Walk for a Healthy Community on May 16. Our dogs in advanced training were sporting orange bandannas today while they worked on their service dog skills at Giant. The orange was part of CBS21’s Orange Out today to support Owen’s Foundation, which raises awareness about the consequences of distracted driving. The foundation was started after 8-year-old Owen Brezitski was killed by a distracted driver as he was crossing the road with his family. 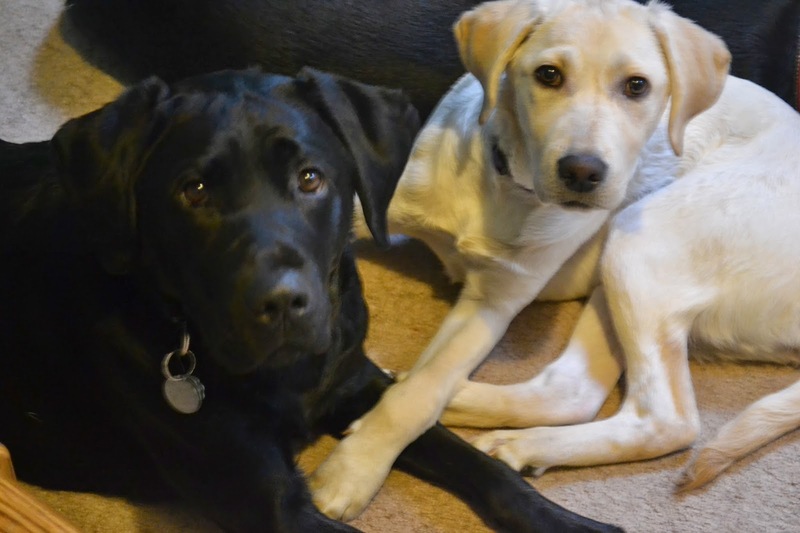 Two of our dogs in advanced training—SSD Oboe and SSD Olympia—are part of Owen’s Litter, the puppies named by Owen’s family. Oboe and Olympia both wore the orange bandanna as they trotted through Giant. Today, we went to Giant on Linglestown Road, and the dogs spent two hours walking around. Check out these photos of the dogs at work. SSD Olympia practices "under" beneath a table of baked goods. SSD Hank keeps his attention on his handler. Just before this, he was working on the cue "lap," where he rests his front legs in his handler's lap. SSD Cove rests while her handler looks at produce. SSD Beaker (front) and SSD Cove relax in down-stays while their handlers shop. SSD Brickle practices working beside a shopping cart. SSD Oboe sits in the food court/lounge area and ignores the activity around him. SSD Nola also practices working beside a shopping cart. SSD Mali stays under the table. SSD Bridge chills out in his balance harness after practicing walking next to his handler. SSD Mint sits and ignores the food behind her. Working in public is an important part of the dogs’ training. Once they’re placed with their person, they will accompany them almost everywhere. The dogs will need to be comfortable working in any environment so they can continue to assist their partners no matter what situation arises. Grocery stores can be especially challenging for dogs in training. In the produce aisle, there may be small pieces of vegetables or fruit on the floor that they have to ignore. They need to ignore the other shoppers, as well as the products on the shelves. No free sniffs! The dogs in advanced training did very well working at Giant!